Tim Wardell on KJCD radio. In the midst of despair caused by grief, illness, joblessness and substance abuse, God is making waves in Allen, South Dakota—radio waves, to be exact. Since CHOGnews last spoke to missionaries Tim and Kim Wardell in February 2017, the pastors have witnessed the incredible love of God at work on the Pine Ridge Reservation in the Oglala Lakota Nation. Before the end of 2017, the pastors prayed for direction regarding how Pass Creek Mission could serve God in the coming year. In response, Tim received a vision for a radio ministry that would reach listeners on the reservation and beyond. However, without necessary equipment, the Wardells were left to question how such an extraordinary idea could become a reality. Soon after receiving the vision, Tim was inexplicably inspired to attend a meeting in Pine Ridge; once there, he would realize why. 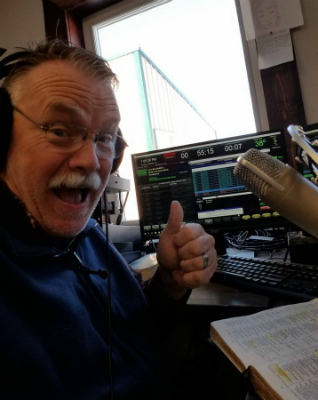 Beginning March 1, Tim will officially take over as manager of KJCD Pine Ridge, broadcasting devotions, Scripture, and the encouraging message of Christ’s love to the surrounding area. “My wife is the brains of the operation,” said Tim. “She’s coming up with some great ideas. We are going to look into interviewing some of our short-term mission teams.” In addition, ideas for a children’s segment and messages specifically for women are in the works. 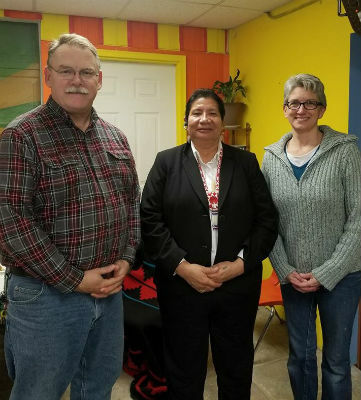 In early February, Tim and Kim Wardell were honored to meet Darla Black (center), vice president of the Oglala Sioux tribe. Right now, the KJCD station reaches up to 20,000 people and operates on a low frequency, largely due to lack of funds. For Tim, getting to the station to record is a 50-minute trek; for the time being, he will be doing all his recording for the week in just one day. On top of the many other ways he and Kim are carrying out God’s mission in Pine Ridge, managing a radio station will be no simple task. However, the Wardells are enthusiastic about the ministry’s potential to shine light in a community that often feels overwhelmed with darkness. Off the air, the Wardells have also helped to begin the Healing Circle, a modified version of Alcoholics Anonymous. Designed by a friend, Pastor Matt Hadden, the program incorporates relevant Scripture into the original twelve-step addiction recovery plan. “AA makes a lot of vague references to God, our Creator. We want to be very specific,” said Tim. Meanwhile, Kim has found a way to reach out to those suffering from loss through Good Grief, which encourages women in the community to gather together to do an activity or craft while engaging in discussion, asking questions and building friendships. In an area with a suicide rate 70-percent higher than the national average, Kim saw an overwhelming need for nurturing relationships and compassion. In August of 2017, the Wardells suffered their own devastating loss when their twenty-three-year-old son Caleb passed away as a result of suicide. The community Tim and Kim had been serving then turned to serve them with kindness and love. It was then that the true power of relationship and community became even clearer to the couple. 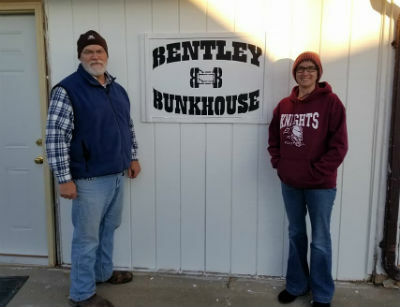 Tim and Kim Wardell carry on the legacy of the Bentleys in Allen, SD. Recently, Kim has also felt inspired to reach out to victims of domestic violence. “I live with ladies who deal with constant domestic violence—it is the norm,” said Kim. “I asked one of the girls, ‘Do you know any women in this village whose partner does not hit them? She said No.” As a response, the Wardells are hoping to help re-open a women’s shelter in the local area that had been shut down due to lack of funding. Although constantly motivated by God’s love, even in particularly exhausting and trying times, the Wardells are also hoping to see another couple come to Pass Creek Mission to serve beside them as the ministry grows. From anywhere, listeners can tune in to listen to Tim’s devotions and messages and support the nonprofit station at www.KJCD.com. Learn more about the Wardells and Church of God Native American Ministries, including opportunities for prayerful and financial support, at http://www.jesusisthesubject.org/native-american-ministries/. This entry was posted in All Church of God, Central, Home Missions and tagged Allen, broadcast, community, home missionaries, Kim Wardell, KJCD, Native American Ministries, outreach, Pine Ridge Reservation, radio, radio ministry, SD, South Dakota, Tim Wardell. Bookmark the permalink.